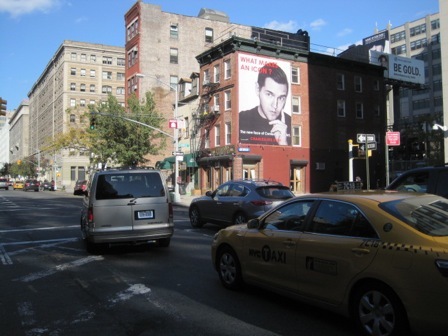 One of the four billboards in New York installed by Prince Media Company as part of Brooklyn-based artist Charles Lutz's “What makes an Icon?” project. Philip Kafka hung up his racket at the age of 23, merely months into a professional tennis career. His reason? He felt he wasn’t good enough, and decided to smash his way into being an entrepreneur instead. Today, he’s the founder of Prince Media Company, which deals with leasing out-of-home advertising spaces in New York such as building walls to advertisers. “Bottom line, I didn’t achieve my goals, and like with any business-minded person, I had to cut my losses,” he candidly admits. 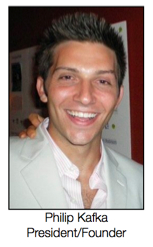 Philip Kafka then looked at turned to his father’s 28 year-old company Impact Outdoor Advertising, a privately-held billboard company in Dallas, Texas, and began learning the business by helping his father with day-to-day operations and projects. Earlier this year, while in New York City for a series of job interviews, he realized that his knowledge learnt from his father’s business gave him an eye in scouting out potential sites in the Big Apple for outdoor advertising. By the end of his two-week trip, Philip had secured three wallscape locations – which he attributes to “a lot of work but a lot more luck” – and started Prince Media Company. Today Prince Media Company operates ten locations in New York but continues to look at acquiring other “marketable walls for advertising”. It works with advertisers like Guess Jeans, MoMA, and Corona, to boutique designers and artists, and one of its latest projects is “What makes an Icon?”, the first large-scale installation by Brooklyn-based artist Charles Lutz in New York. “Even though some might wonder how a Texan with a Philosophy degree, and almost no work experience could end up running a company in New York, it’s simple – New York is the best place to conduct business in the world, it calls everyone’s name,” Philip says, adding that his father grew up in Brooklyn so he’s not too unfamiliar with the city. In fact, Philip attributes a lot of his inspiration to his father – the most important lesson he’s learnt from senior Kafka was a quote that goes “Philip, you ain’t got nothin’ ’til you got everything”. “In other words, you can’t count on anyone or anything until you get the signature on the dotted line,” he explains. Philip takes a very philosphical view when considering the essence of an entrepreneur. “Intelligence and idea generation are accidental, hustle and focus are what make a man an entrepreneur,” he says.